Hytronik presents a completely new approach to lighting control – by introducing a range of wireless products based on Bluetooth technology. Hytronik’s new series of Bluetooth dimmers called HBTD8200X is available in variants for the most common dimmer technologies – Trailing Edge, 1-10V, DALI or On/Off function. HBTD8200 series products are ideal for controlling LED luminaires or other traditional light sources in the home environment or at the office. Hytronik’s new Bluetooth sensors for installation in luminaires come in both master and slave variants. The app allows quick and easy commissioning/grouping of Bluetooth sensors. The combination of a control unit + Bluetooth sensor allows it to be fitted in luminaires with limited space. The control unit can also be hidden behind the PCB for a shadow-free installation. Control options are available in variants of 1-10V or DALI depending on requirements. The daylight harvest function has been improved by our latest technology, known as Photocell Advance. With the Photocell Advance technology users can attain maximum energy saving and simplify the design of fairly small luminaire solutions. 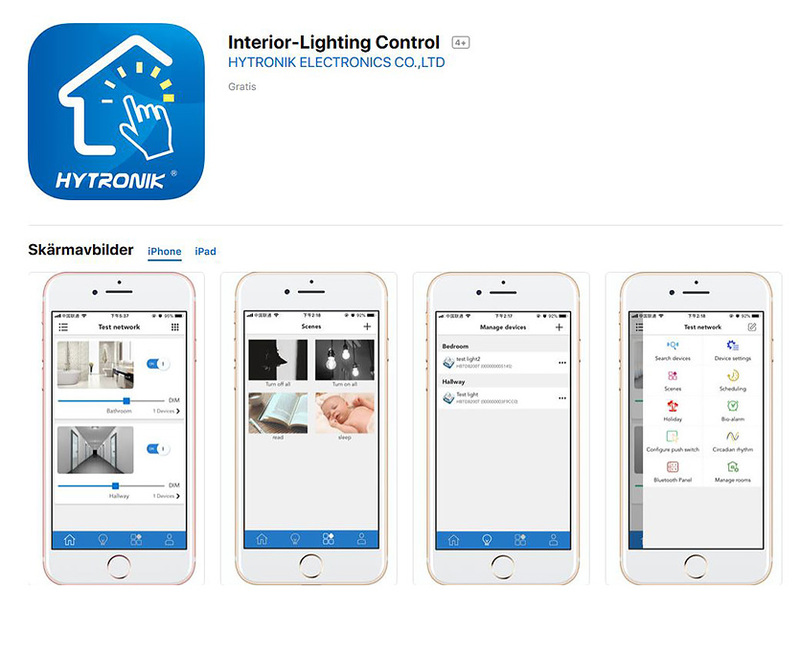 Hytronik’s Interior Lighting Control app for Android and Apple’s iOS allows new cost-effective upgrades to be implemented on existing systems. You choose how to configure your mesh network via the apps. The app user interface has a simple design in both settings and operation for a clear plug-and-play experience. Simplify installation with our User Manual – we go through every step from installation to how to get started with the app (link to pdf).